Paper mache has been an art form since way back (we're talking 202 B.C.!) and is as popular today as ever. If you want to try your hand at paper mache, one of the first things you need to do is find a project to try. These 15 crafts include a wide variety of ideas and take the classic paper mache technique to the next level! Transform paper mache letters from the craft store into chic wall decor with the help of paint and a sheet of wood veneer. Add some design excitement by substituting a heart filled with succulents to represent the letter O. Everyone loves a good Ikea hack! Turn an ordinary $1.99 Ikea Vasen vase into upscale home decor with cloth and glue. The fabric is substituted for paper with this technique, but the rest of the process is the same. You will end up with a beautiful vase that looks like a work of art. Do you have a black thumb when it comes to houseplants? Those of you that find taking care of plants a challenge will love this paper mache project. A pot and a faux string of pearls hanging plant are constructed with celluclay, a dried paper mache product. This plant will always be beautiful, and you will never have to worry about watering it. Make some of these trendy wood veneer boxes to store your items. No one will ever guess that these are constructed from ordinary paper mache boxes covered with a thin layer of wood. Giant sized paper mache flowers are easier to make than they look. Use them for party decor, a photo backdrop, or theatrical production. Plan an outdoor fairy tea party for kids. Your backyard will be a magical wonderland when decorated with giant-sized flower party decor. If you are a Game of Thrones fan, you will appreciate this paper mache party crown. It is a representation of the crown of antlers worn by Renly Baratheon, one of the heirs to the Iron Throne. Why not make some paper mache crowns for all your friends to wear while hosting a Game of Thrones viewing party. Make a southwestern themed vase from cardboard tubes and newspaper. You can actually place fresh flowers into the vase because small shampoo bottles are hidden inside, enabling you to add water. Does your child love science? Kids will undoubtedly enjoy this giant-sized paper mache moon. This project serves as a great teaching tool for inspiring curiosity about astronomy, combined with an art lesson. Paper mache hearts with black and white doodle art are cute for Valentine's day or as a simple piece of home decor. Molds are filled with paper mache, and then doodled hearts are decoupaged to the top. Decorate your child's room with this adorable giant paper mache hot air balloon. This balloon has a hanging basket complete with two of the cutest mice aviators. Your child's creativity will be sparked imagining far away adventures every time they look at the hot air balloon. This birdy bank is an alternative to the traditional piggy bank. 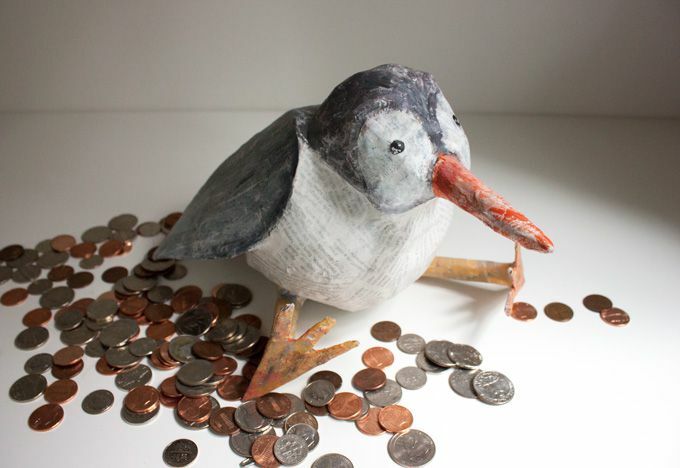 The paper mache bird is so cute, that you'll want to use it as part of your home decor, as well as a piggy bank. Pinatas are a lively addition to any party. If you are having a tropical themed party, pineapple pinatas will help get your festivities started. Have you ever wanted to play with your food but were prevented by an adult scolding you for bad behavior? Now you can! Immortalize the ordinary burger and fries as a piece of sculpture. This burger looks surprisingly realistic and is a true piece of art. Make a disco ball costume that will be the hit of any Halloween party. Construct this clever outfit from a 36-inch balloon, holographic tape, and lots of paper mache. You will be the belle of the ball (literally) with this unique ensemble. Decorate your plants on Halloween with a scary carnivorous paper mache creature, complete with a set a realistic looking teeth. Your home will look as if it was a scene in The Little Shop of Horrors. Kids will love the creepy vibes this Halloween decoration projects. The carnivorous plant is guaranteed to send chills down the spine of anyone that gets too close.